Job: Private Household Demon Age: Over 300 Birthday: March 14 Class: 2-B Bloodtype: ? (O-type character) Height: 159cm (with bun) Weight: 44kg BWH: 83-58-84 Likes: Firetruck, sweets, anime Dislike: Scary things Elsie is a shinigami who was assigned to capture evil spirits that have escaped from hell and is the Deuteragonist of the story. She is shown to have a very sweet, pure and innocent personality and often tries to please Keima's expectations as a "little sister" though often fails due to the cultural differences between them and how her endeavors usually leave Keima in a bad situation. She is fairly popular among young males, apparently more people (primarily boys) began coming when she began working in the family's cafe, such that Keima's mother once had her dress as a maid to attract more customers on the ground that no-one could resist her when she's wearing it (from the reactions around her while she's wearing it and after she takes it off it can be inferred to be true). Her feather cloth (the floating scarf she is always seen with) can change the appearance of an object, create disguises to aid the mission or it can hide people in plain sight. She is left-handed and is rarely seen without her broom, which she had for 298 years, as it was from her original role as a cleaner for hell. She reveals that she has an older sister that was very famous and was known as the "Demon of Demons". Ironically, despite being a demon, she is shown to have an incredible fear of ghosts and the dark. To stay close to Keima, she tells Mari, Keima's mother, that she is an illegitimate child of Keima's father (nearly getting his parents divorced), and ends up living in the Katsuragi household as well as attending the same class in school. She frequently refers to Keima as "Kami-nii-sama" even when they're alone and there have been indications that she may have feelings for Keima, becoming flustered when he practices confessing with her, licking off cream that was left on Keima's face, blushing everytime she looked at him when they went to an amusement park and becoming furious when he nonchalantly states that they weren't on a date (due to miscommunication between Keima and Elsie). Elsie is often made fun of by the other demons because of the poor grades she had in the demon academy and she is shown to get equally bad marks at school, partly because she is not familiar with kanji writing and reading because she studied Japan during the Edo period 400 years ago. 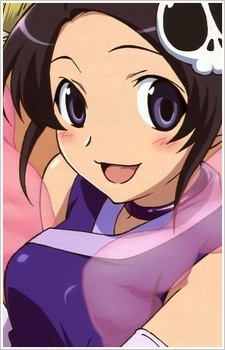 However, after partnering with Keima, they were able to capture 9 escaped spirits within half a year's time, which gets her nominated for the Great Demon Medal recipients (despite some section chiefs being dubious of her skills) and earning her the Section Chief's Award (which she doesn't receive due to her being busy cleaning Hell in nostalgia). As of now, Elsie and Keima have captured 14 escaped spirits. Elsie is also a member of Chihiro's band. Responsible for the bass (Jazz bass flipped upside-down). She also has developed a strange interest in fire trucks.